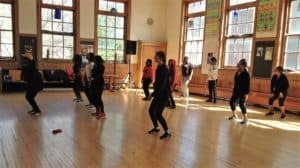 The West Park Cultural Center is offering their danceLogic program for the second time this year, a unique S.T.E.A.M. program that combines dance and computer coding leading to the development of original choreography and performance. Girls ages 13 through 18 years old learn the value of focus, dedication, and teamwork, as well as industry standard coding language. danceLogic is an innovative program designed to educate, inspire and cultivate girls of color, regardless of their background or financial status, to explore the S.T.E.A.M. field: science, technology, engineering, arts and mathematics in a creative, active and exciting structure. Dance and coding have similar language involving repetition, direction, and combinations. The program uses dance to spark an interest in STEAM, now and in the future. The very first session of DanceLogic culminated with a performance at the 11th annual West Park Arts Fest. The girls performed choreography, shared what they learned and how it has impacted their lives. They committed to continuing their coding education over the summer and into the new school year.